Looking for something exotic for your new baby? 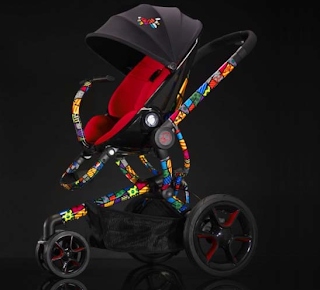 Check out these luxury baby strollers and luxury baby car seats, designed by Brazilian artist Romero Britto. A neo-pop artist and sculptor, Romero Britto is best known for his vibrant artwork, which combines elements from cubism, graffiti and pop art. This line of luxury baby strollers and baby car seats was launched by the Dorel Juvenile Group, as part of their special line of Quinny and Maxi-Cosi products. This will be the first time people will be able to view Romero Britto’s art work out of an art gallery or art museum…and on a baby stroller and infant car seat. The Romero Britto designed luxury baby stroller has been named ‘Moodd by Britto’. It unfolds automatically, and is compatible with other Quinny products, like the Maxi-Cosi baby car seats, and the Dreami bassinet one-hand recline. This luxury baby stroller will be sold for the retail price of $900. 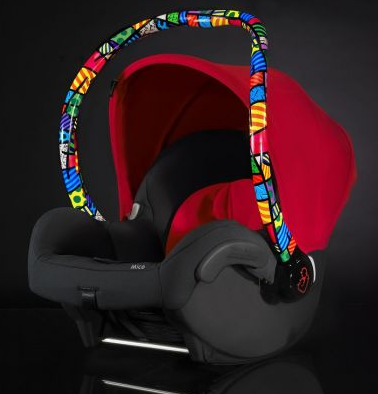 The Max-Cosi Mico luxury baby car seat, which also has Romero Britto’s artwork, can be purchased for just $250.